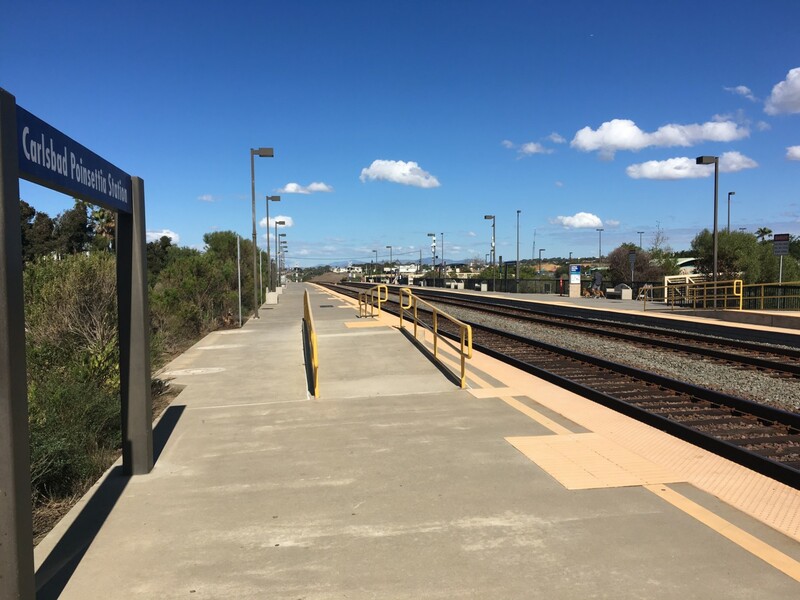 CARLSBAD — One year after its proposed renovation, the Poinsettia train station rehabilitation will begin in April, according to the San Diego Association of Government. Jim Linthicum, director of mobility for SANDAG, updated the Carlsbad City Council on Feb. 13 of the organization’s plans, timeline and budget for the project. He said a stretch of the corridor, known as the San Luis Obispo-Los Angeles-San Diego corridor, will be double tracked to improve travel times. In addition, the project also consists of below-grade passageway for travelers, raising the platform to be in sync with Amtrak trains and extending the platform to 1,000 feet. “It will improve travel times and reliability and we’ll also have better amenities out there,” Linthicum said. The upgrades are necessary, Linthicum said, as the corridor is the second busiest in the country, behind the northeast corridor running from Washington, D.C., to Boston. The California line features Amtrak, the Coaster (North Country Transit District) and freight trains. He added the station will be similar to the Oceanside Transit Station with the upgrades plus adding shelters. The under crossings, meanwhile, will improve safety as riders must cross the tracks in its current state. As for the double tracks, Linthicum said about two-thirds of the county’s corridor is completed, and with this and more than 20 other projects are completed, about 75 percent will be double tracked. The tracks, meanwhile, will be moved west several yards along with two new rail crossovers south and north of the station. The crossovers allow passenger and freight trains to cross from one track to another as needed. Naturally, with construction comes noise. Linthicum said SANDAG will minimize it by working mostly during business hours. However, some work must be done during the evening or night along with service interruptions. The project budget is estimated at $33.7 million and is expected to be completed in 2020. Of the budget, $16.1 million is from the regional TransNet sales tax, $13.6 million comes from the Federal Transit Administration Regional Surface Transportation Program and $4 million from the state. Flat Iron was awarded the contract. With the improvements, Linthicum said level of service will increase once the work is completed.